Spanish (Rotterdam based) architects Helena Casanova and Jesus Hernandez have developed a strong pictorial strategy for their exhibition in the Architektur Galerie Berlin (17.05. – 29.06.2013). 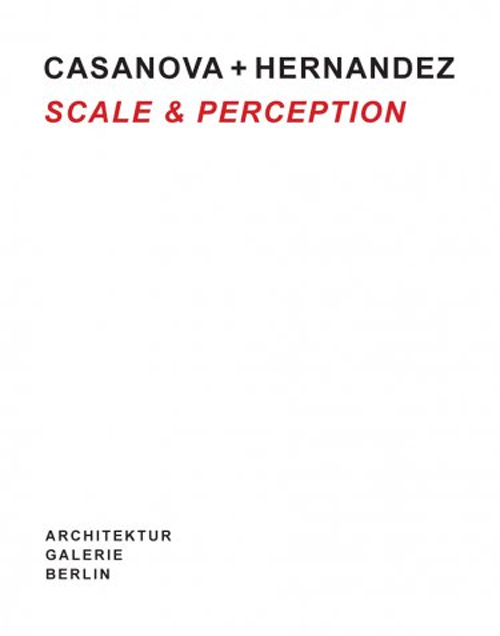 The book Scale & Perception with the same title as the exhibition serves to provide greater insight to Casanova + Hernandez' central theme of architecture, based on photographs by Christian Richters. They show, from his point of view, the many overlapping layers which define the visual perception of the buildings. They are accompanied by numerous plans and sketches showing the role of every single layer in the creation of the overall perception. 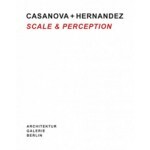 The book is completed by the manifesto-like text "Scale & Perception: Rethinking Phenomenological Architecture in the Global Age" by Casanova + Hernandez. Titled "Scale & Perception", they concentrate their translation in a minimalist installation, composed of two miniature walk-in spaces: One is a wooden object, black outside, white inside, with "walls" perforated by differently sized openings that function as windows; the other is a rectangular space, open on one side so that visitors can step inside, and made of plastic foil imprinted with a ginkgo-leaf motif. These miniature spaces serve as image carriers of Casanova + Hernandez´s recently completed "Black and White Twins" and "Ginkgo Project" housing complexes, and can be equally understood as a manifesto of their work. The architects´ focus is less on the function of habitation and more on the question of which simple measures can be used to modulate the perception of simple forms. Whereas the solution is a geometric, subtly structured façade for the "Black and White Twins", the seemingly playful ornament of an impressive glass façade defines the "Ginkgo Project". The concept of changing perceptions resulting from varying spatial distances is of particular importance. Only upon close inspection does the "Black and White Twins" façade reveal itself as an artful texture of overlapping linear structures. Developed from both the positioning of windows - mirroring interior function - and parameters of façade materials, this texture can be read as an abstract reference to the division of the surrounding building lots. On a huge open space, lacking significant landmarks, a shape had to be created, resulting in a striking urban structure. The "Ginkgo Project´s" stock of buildings, on the other hand, is defined on one side by an existing residential estate, on the other by a beautiful park with old trees. In spite of the almost diametric formulation of the façade details, which the architects call the "skin," here as a rationalist theoretical exercise, there as ornamental playfulness, they address the same idea: Both projects share the strategy of making perception and their order (from distance to proximity) a subject of focus. The exhibition follows the same principle: Whereas the observer can only perceive a newly structured exhibition space from the distance, upon approaching s/he becomes aware of the differences in structure and their duality: Rationally ordered on one side; sensually ornamental on the other. Within both miniature structures, elements can be discovered that refer to details of the site and its usage. In the Ginkgo installation the elements are artificial grass covering the floor, a simple plastic chair and a potted plant - objects that are found on balconies around the world and with which people use to make their homes "nicer." In the Black and White installation on the other hand, photos and models are integrated. The miniature spaces thus breathe in the varying characteristics of both projects they represent through to the detail: the sensual in one, the rational in the other. The structured layers elucidate the credo of architecture as "boxes" that share the same function, but covered by various layers can be interpreted in different ways. The "skin" as an architectural tool does not pretend to not exist, but remains recognizable as a consciously designed membrane separating inside and outside. As central concepts of Casanova + Hernandez´s architecture, scale and perception are transformed into the exhibition space through these artifacts, both concrete and abstract.